As the implementation of the China-Pakistan Economic Corridor (CPEC) project moves forward, China continues to expand its presence in Pakistan-occupied Gilgit-Baltistan, both militarily and economically. The local population voices concern over this “silent invasion”: while many Chinese are employed in the region, natives have restricted access to the job market; while the native Balti language cannot be taught, Mandarin is now an option in local schools. Furthermore, a Chinese army headquarters is being built “for the security of the CPEC”. The region is not only paramount to China’s economic and political ambitions, but also connects it to the Chinese military complexes in the northwest of Tibet. Indigenous communities of Gilgit-Baltistan remain with no political autonomy or a functioning legal system for human rights protection, struggling under Pakistani repression and occupation. The United States hosted the Chinese leadership on the scenic coasts of Florida at a time when American foreign policy vis-à-vis China is swinging like a pendulum between hard-line antagonism to humble submission. President Donald Trump started with the Taiwan question and attacked the “One China Policy”. And now Secretary of State Rex Tillerson, in his March visit to Beijing has indicated a conciliatory policy. In general, the most powerful western democracy appears baffled due to these China policy flip-flops. China, on the other hand, is clearly working steadily and confidently towards its strategic objectives on various fronts and outmanoeuvring the major western world powers. One such initiative is the China-Pakistan Economic Corridor (CPEC). This is a strategic multi-billion dollar project, which is set to counter all the influence the West currently has in this region. The China-Pakistan Economic Corridor (CPEC), announced during Chinese President Xi Jinping’s two-day (20-21 April 2015) visit to Pakistan and with a value estimated by Pakistanis at US$46 billion, reshapes strategic environment in the region. China, with this initiative, plans to achieve multiple crucial objectives. The project will ensure Chinese energy security, with the link to the Middle East. China also plans to assert its maritime presence in the Gulf of Oman and the Strait of Hormuz. The CPEC project plan is to connect Kashgar, in Chinese Xinjiang province, with the port of Gwadar, which is in South Pakistan. Gwadar is an entry point to the Gulf of Oman. Beijing maintains its policy positions that the marine corps deployment, which will happen in the Gwadar port is to promote local development and for humanitarian reasons. The CPEC also passes through the trans-Himalayan region of Gilgit and Baltistan (GB), which is under Pakistani control. India repeatedly underlined its claim over territories of Jammu and Kashmir under Pakistani occupation and Gilgit and Baltistan (GB). Pakistan in the past recognised Chinese sovereignty over hundreds of square kilometres of land in the northern Himalayan region through the controversial Sino-Pakistan Frontier Agreement. China and Pakistan are furthering their objectives and partnership through CPEC by occupying GB. Both China and Pakistan are not only ignoring the legitimate concerns raised by the GB local population, but are also violating their human rights to achieve the CPEC objectives. GB is a pathway to CPEC, yet according to GB residents, participatory development is non-existent. One of the concerns voiced by GB locals is right to compensation for the acquisition of community land. Resentment is also growing amongst the local population over Chinese presence in the GB region. The locals feel Pakistan and China are exploiting their resources. Several local NGO delegations and intellectuals who study the region are voicing these concerns in the United Nation Human Right sessions. Senge H. Sering, a scholar from Gilgit-Baltistan based in Washington DC, wrote: “China has a huge and long-term presence in Gilgit-Baltistan and is building extensive road, bridge and telecom networks to sustain it. The drivers compelling China to develop Karakoram Corridor are diverse and mainly pertain to its economic, strategic and political ambitions.” China’s control of GB will enable this area to be connected with its military complexes of northwestern Tibet. Thus, there is a clear military component to this much-touted economic development project. Further, locals are also troubled by the fact that there is a construction of an army headquarters in GB region for the security of the CPEC. Many local leaders and human right activists are expressing their concerns over this silent invasion by China. The situation is also complicated by local demographic changes initiated by the Pakistani government to keep the region under control. Pakistan is actively trying to increase a percentage of the Sunni population in the region. Pakistan has very recently made a move to declare GB its new province. China is running several projects in the area — from mining exploration to highway construction. And hence there are a lot of Chinese workers in the GB region. The striking concern is that the locals are not allowed to do mining and they do not get many jobs. 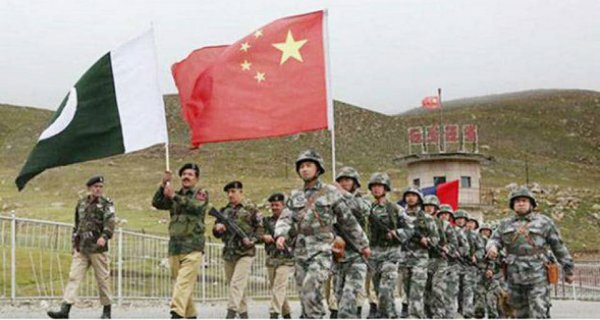 At the same time, China has posted its soldiers to protect its objectives and assets in GB, something that has been strongly opposed by India. These soldiers and the fact that most of the workers are also from the People’s Liberation Army have perturbed and petrified native people. While Mandarin language and its script have been introduced as an optional language in schools in the region, there is a complete ban on the teaching of the native Balti language, which is like Tibetan. Thus, the region is under virtual Chinese occupation due to military presence and hyperactive economic activity. Through expansion of its proxy occupation of Gilgit Baltistan along with CPEC, China is getting a step closer to its strategic vision of “Zhong Guo (Mandarin)” the Central Kingdom.